Help your clients stay looking great with the Shoe Shine! 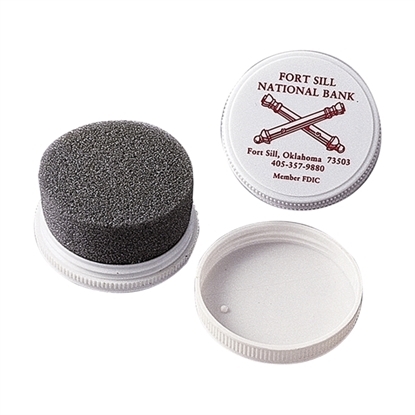 This compact polisher helps shoes stay clean and shiny and measures approximately 2 1/4" diameter. Whether your business is a shoe store looking for a themed promotion for your store or your company is a podiatrist office trying to remind clients to keep their shoes appearance nice, this is the promotional product for you. Silkscreen it with your company name and information to keep clients coming back for more time and time again. Make sure their shoes are as bright as their smiles! 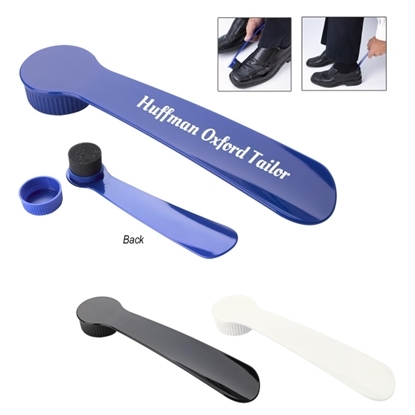 Boost the name of your company when you make this shoehorn with shoeshine available to your clients! It fits in your briefcase or travel bag and allows people to easily step into their shoes and use the cleaner to make them look as good as new. This is great for shoe or apparel stores to make available to their customers. Just be sure to add your company name or logo to this product. That way, anyone who needs the assistance of this product will know where to find more great items! Mypromotionalpens.com offers the largest and best priced selection in Promotional Shoe Shine Kits. We will price compete and we won't be under sold. Let our graphic designers make your personalized Shoe Shine Kits standout above the crowd at no charge. We won't stop until you are completely satisfied with your custom Shoe Shine Kits art proof.Use category search filters on your left to help narrow your search to find exactly what you are looking for.